Miami protest demands: “No to U.S. coup in Venezuela!” | Fight Back! 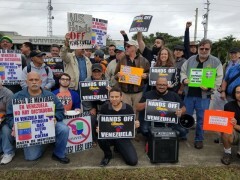 Doral, FL- Fifty passionate activists gathered on a sidewalk across from the Univision TV station in Miami, January 26, to denounce U.S. attempts to overthrow the democratically-elected government in Venezuela. The protest targeted the overt and illegal coup plans being hatched by Donald Trump and the U.S government, and media stations like Univision and CNN who continue to spread propaganda pushing for intervention and regime change. This bold action was held in the heart of Doral, a city in the Miami area known for being home to Trump National golf resort and an extremely right-wing, wealthy Venezuelan community. In fact, Doral has the highest percentage of Venezuelans than any other U.S. city – several of whom shouted obscenities and derogatory cries, as well as threats to the protesters as they walked or drove by. Those in attendance represented many backgrounds and nationalities. Speakers representing Venezuela, Cuba, Colombia, and Nicaragua were some of those who addressed the crowd by denouncing U.S. intervention in their respective home countries. 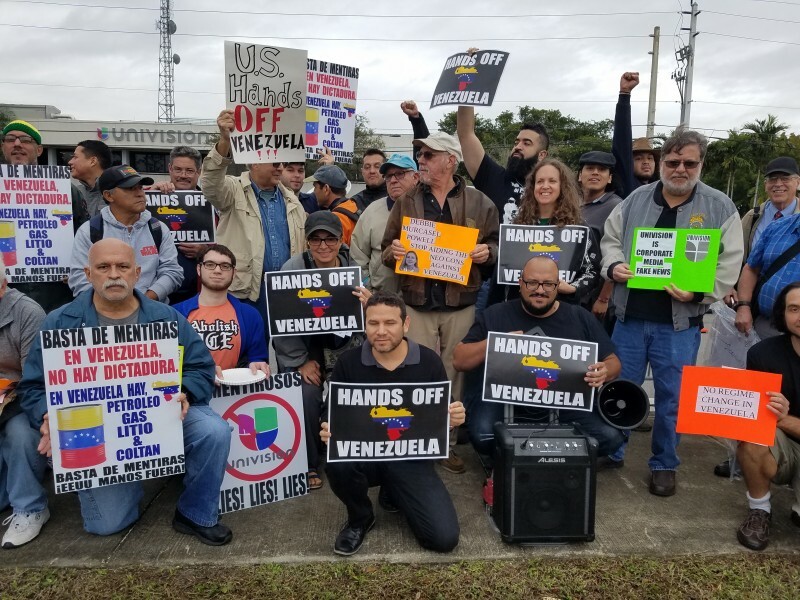 The event was organized by the Emergency Hands Off Venezuela Committee, a coalition the represents several progressive South Florida organizations, and that will continue organizing against any U.S coup attempts in Latin America.